Jewish religious itinerant preacher, skilled as a narrator of Torah and religious stories. Learn more about "maggid" on the online Jewish Encyclopedia. Sent by Harry Boonin (www.Boonin.com) who found this image in a book published in 1895 in Manchester, England. Masliansky would leave for New York City in the summer of 1895. About nine years later he would be lecturing at the Educational Alliance where he would inspire many young men, including "Abe" Silver. What is a magid? From his autobiography Masliansky's Memories - Forty Years of Life and Struggle, written in Yiddish and published in 1924. MASLIANSKY, ZVI HIRSCH (1856–1943), popular Yiddish orator, the most eloquent and influential Maggid on the American scene at his time. Masliansky was born in Slutsk, Belorussia. He taught at the Polish talmudei torah and at the yeshivah of Pinsk (1882–90), where one of his students was Chaim Weizmann. Stirred by the pogroms of 1881, he became a proponent of the idea of a return to Zion. 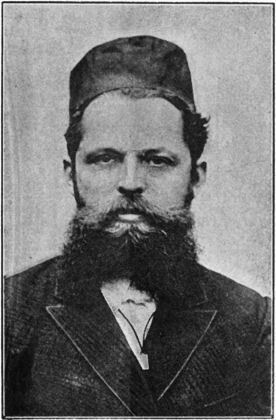 He was active in Hibbat Zion, and fellow-Zionists M. M. Ussishkin, M. L. Lilienblum, Ahad Ha-Am, and L. Pinsker encouraged him in his activity as a wandering preacher of Zionism. His fame as an impassioned orator spread rapidly throughout Russia. Compelled to leave the country in 1894, he undertook a lecture tour of Central and Western Europe and in 1895 emigrated to New York. During the three decades that followed, he helped popularize Zionism, wielding a great influence upon Yiddish-speaking immigrants, especially through his Friday evening sermons at the Educational Alliance on East Broadway. He combined the qualities of a maggid and those of a modern speaker. He was able to hold the attention of a popular audience and scholars as well. His imposing figure further strengthened the impression he made. He was also active in U.S. Zionist organizations. By Joseph Masliansky, Brooklyn, N.Y. Stories as told to me by my father Aaron, who recalled every sermon. Zvi Hirsh's father, Chaim and my grandfather Avraham Yitzchak's father, Yehuda Leib, were brothers. For the most part, they lived in Slutzk, White Russia. The families were as one, and considered themselves more like brothers than cousins. Zvi Hirsh started to speak at a very late age and everyone thought that something was wrong with his vocal cords. Surprisingly, at the age of 7, to the bewilderment of his parents, on Shabbat Chazon, the Sabbath before Tisha B'Av, he picked up the table cloth from the Sabbath table, put it on as a Talis and spoke of the destruction of the Temple before his friends. His father, sensing the deep and innermost feelings of his son, scolded him for having taken the table cloth as it was not dignified to leave the table uncovered on the Sabbath. His memory was fantastic. He knew the entire Tanach by heart at an early age. He was an ardent Zionist and traveled around Russia and Poland preaching for the cause and giving hope to the destitute, homeless and the poor. On one Saturday, he spoke in a synagogue about AVNER. Avner was a general of King David. But the audience knew the Avner that Masliansky was talking about. Not General Aviner but Avner stood for the initials of the Czar's name. Alexander Ben Nicholai Romanov. The first letters spelled AVNER. A Jewish informer who was in the congregation notified the Russian police and they-gave him one month to leave-Russia. In New York, when he arrived, the Yiddish newspapers announced that Masliansky Yidaber, Masliansky will speak on that Sabbath at the Beth Hamedrash Hagadol on Norfolk Street, the East Side. Thousands came to greet him and the New York police had to make a path for him to enter the synagogue. He remarked, look how wonderful the new world is. In Russia he had to run away from the police and in New York, the police made a path for him. This happened in 1896. In 1910, at a case involving the stopping of new and especially Jewish immigrants from Poland and Russia, brought on by the Commissioner of Immigration who was known as "Czar Wilson", Masliansky was called upon to testify for the unwanted refugees traveling in steerage. He made the following statement when confronted that what this country needed was muscles, brawn and strong backs to build the railroads and factories. His reply was "strong muscles and brawn can also make criminals and burglars who break locks. Strong minds and brains create a world of creativity and progress that builds a country." He created a stir and won the case. The refugees did not have to return to Europe. His strong words were and are responsible for all of us to be in the U.S. today. We too could have perished in the Holocaust had our grandparents and parents been denied entry to this country." Note: Though Masliansky always called himself 'Reverend' many of his supporters believed he had been ordained in Russia. Dr. Gary P. Zola's study of Masliansky makes no mention of Masliansky's ordination. His archives are found at The Jewish Theological Seminary. It has an anecdote to explain why he didn't call himself "rabbi". "We learn about Rabbi Tzvi Hirsch Masliansky and his negotiating for a new position in New York. The president of the shul mockingly pointed to a wall-painter working in the room. “What? You want to earn as much as a shmirer? ” Rabbi Tzvi Hirsch responded that if rabbis in America were likened to shmirers, then he would not be a rabbi! Thus, he remained “Reverend” Masliansky for the rest of his career as a popular orator, although he had been ordained by some impressive sources in Europe." Dr. Gary P. Zola, in his study of Masliansky, calls him "Matif Leumi" - The National Preacher. Soon after arriving in New York in 1895 he altered his appearance, his beard becoming a more modern goatee, and changed his speaking style. Still preaching in Yiddish, but no longer speaking only of Zionism, "Masliansky preached a love of Judaism and a pride in Jewish peoplehood." He was admired and supported by established, wealthy, largely German-Jewish "Uptown" Jews and loved "Downtown" by the newly arrived Yiddish-speaking Jews from Eastern Europe". Zola writes (p. 36) of Masliansky's lectures. "Delivery was spellbinding. His voice was a full tenor and his movements were startling and dramatic. He thundered and whispered - captivating his listeners for up to two hours." We can only imagine young "Abe" Silver seated near the podium absorbing this and then read an account (only ten years later) of Silver's own oratorical style. By the 20's Masliansky's audiences had declined significantly and in 1927 he resigned his position at the Educational Alliance. Masliansky died January 11, 1943 age 87. His funeral was attended by many leaders of American Jewry and the Zionist movement, including Rabbis Stephen S. Wise and Abba Hillel Silver and Dr. Nahum Goldman. Essay on the changed mission of The Educational Alliance. Now available in a complete English translation. In my early years as a college professor I kept this framed quotation from Henry Adams on a wall of my university office: "A teacher affects eternity; he can never tell where his influence stops." 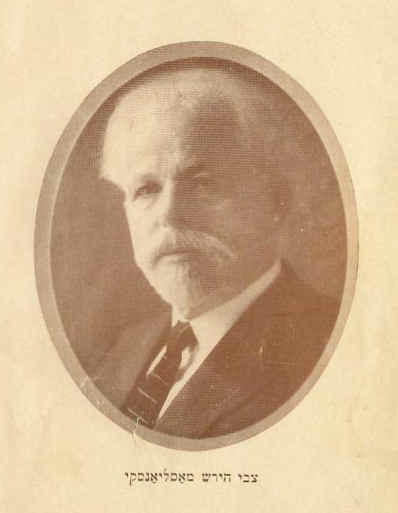 Zvi Hirsch Masliansky was one of the great Jewish teachers and orators of his time. He was example and inspiration for Abba Hillel Silver's oratorical skills, for so did Rabbi Silver write in his unpublished autobiography. Those who know how the State of Israel was established also know how well those skills were used to help change the course of Jewish history. Masliansky was employed for 15 years by the Educational Alliance whose archives are in the care of YIVO. Unfortunately none of these materials are on YIVO's website. There is little on the web about him. In 2007 there were no images of him, until we posted the second image on this page, scanned from his memoirs published in Yiddish in 1924. In November 2009 Masliansky descendants published the first complete English translation of his memoirs, under the leadership of his great-granddaughter Zviah Nardi. Learn more. In December 2009 some Masliansky grandchildren and great-grandchildren told me about his photos now online in a family web photo gallery. To see five of these photos, click here. Then in August 2010 we posted a photo of Masliansky and Abba Hillel Silver, only 13 years old, at a Zionist convention in 1906. view photo. Plus, the family's interpretation of Abba Hillel Silver's handwritten notes for his eulogy of Masliansky given on April 15, 1943.